A group of scientists used an acoustic monitoring program to monitor bee populations at two different sites. The acoustic data was shown to be useful in predicting bee size, the number of bees, and importantly, the amount of bee pollination. Bee populations are on the decline worldwide due to climate change, habitat loss, and pesticide use. 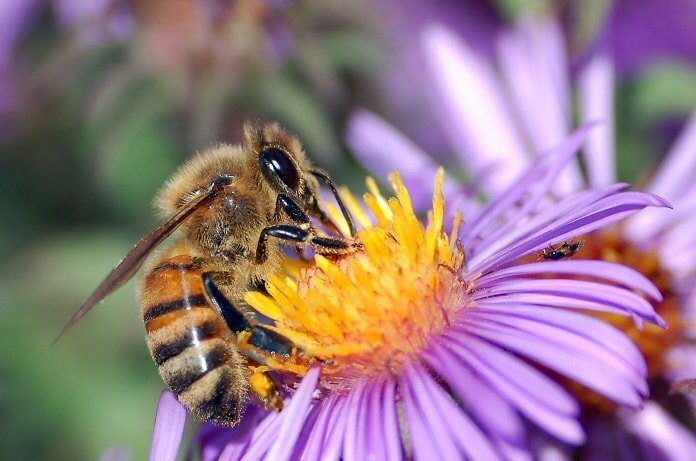 Bees are a vital pollinator of flowering plants, so as bee populations decline the costs associated with pollinating plants and agricultural crops will rise. Scientists use of acoustic monitoring techniques to track the sounds that various organisms make, in an effort to study their communication, behavior, and changes in the population. Fewer efforts have been made to listen to insects in their natural environments; however, this may be a viable technique for monitoring bee populations. The “buzz” that bees make while flying and looking for food may indicate to researchers how often they are foraging and pollinating. In a new study published in PLoS ONE, scientists tested acoustic monitoring programs to observe bee flight activity and determine whether it can be correlated with the extent of pollination. The study took place at two separate sites in Colorado, USA. First, the authors observed that there is a relationship between buzz frequency (pitch) and bee wing length or tongue length, factors that can influence pollination. The scientists then investigated whether acoustic data aligned with visual surveys of how many bees were actually foraging, and they observed that there was a very strong correlation between automated buzz counts and traditional visual survey counts. This suggests that their automated, non-invasive system of buzz counts can act as a proxy for traditional visual survey counts, which are more invasive. The study also determined that the number of buzzes could predict how much pollination actually occurs. This study shows that an automated, non-invasive, acoustic system can be used to monitor bee populations. The acoustic data can be used to estimate the size of the bees, the number of bees in the area, and how much pollination occurs. These findings have large implications in how we can monitor bee populations in the future. With this inexpensive, non-invasive surveying technique, it will be much easier to quickly detect bee population decline so that active efforts can be taken to protect them. Further studies on how to monitor and protect bee populations like these are essential to help prevent the steady, global decline of bees.